The management today suspended work in a Dooars tea garden because of alleged threats by labourers to officials and low quality of work among other things. Wages of three fortnights are due in the Ramjhora Tea Estate which has 977 workers. The management cited five reasons for the "Suspension of Operations" in the plantation. They are disobedience to lawful orders of management, non-completion of task in cultivation work, sub-standard quality of work, intimidation and threat to life of management staff and complete lawlessness. R.P. Thakur, the manager of the estate, said the workers had met him on Saturday to demand the immediate payment of wages. "I told them that I would not be able to pay on that day and I would give the wages for one fortnight on Tuesday. They became annoyed. I returned to my bungalow. About 6pm, 15 workers entered my bungalow and threatened me. One of them, Shekhar Manger, was carrying a dagger." Thakur lodged a complaint with Birpara police on Monday. "Yesterday, we asked workers to join plucking but they refused. I talked to trade union leaders and told them that if there was no change in the situation, it would be impossible for us to run the garden. We were feeling insecure and as a result of lawlessness, we were forced to suspend the work in the garden," said the manager. He said the delay in the wage payment was because of demonetisation. "The payment is held up because of demonetisation. Actually, our garden doesn't have an account in the lead bank because of which we face a lot of problem in getting cash here. Our head office in Siliguri sends cash and then we pay workers," said Thakur. Ramjhora is 74km from Alipurduar. The management today suspended work in a Dooars tea garden because of alleged threats by labourers to officials and low quality of work among other things. 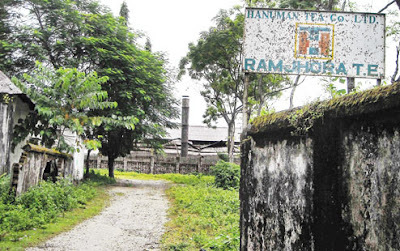 Wages of three fortnights are due in the Ramjhora Tea Estate which has 977 workers.